These lenses are designed for high-resolution line scan applications. The line scan image capture method is useful and efficient for many web and other surface inspection applications. These lenses have a large image circle up to 90 mm for long linear array sizes, and have been optimized for magnification ratios from 0.33X to 2.0X. When choosing an appropriate camera, correct lens selection is critical to achieving the desired system performance. The size of the linear array sensor in the camera determines the minimum required image circle of the lens and the size of the sensor's pixels determines a particular optical imaging resolution. The desired object resolution defines the necessary magnification ratio for the optical system. These application specific parameters let you choose the most suitable lens to meet all requirements with respect to image size and quality. Today's high-performance lenses must follow the technology trend toward smaller pixel sizes and increased sensor resolution. This typically results in larger array sizes and more stringent requirements concerning MTF (Modulation Transfer Function). Macro-Symmar lenses are designed for industrial machine vision applications and satisfy even the most stringent requirements of 12K line-scan applications. These lenses cover a magnification ratio range from 0.33X to 2.0X by using the lens either in standard or retro position. 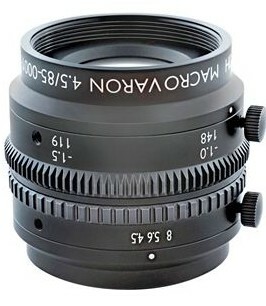 An extension tube together with a special helical mount is used to adjust the focus precisely. Focus as well as iris adjustment are lockable to ensure system stability even in the presence of vibration. A tilt alignment tool can be used to adjust the sensor’s orientation with respect to the optical axis of the lens. The V-mount interface allows alignment of the lens for the best average azimuth position with respect to the linear array.